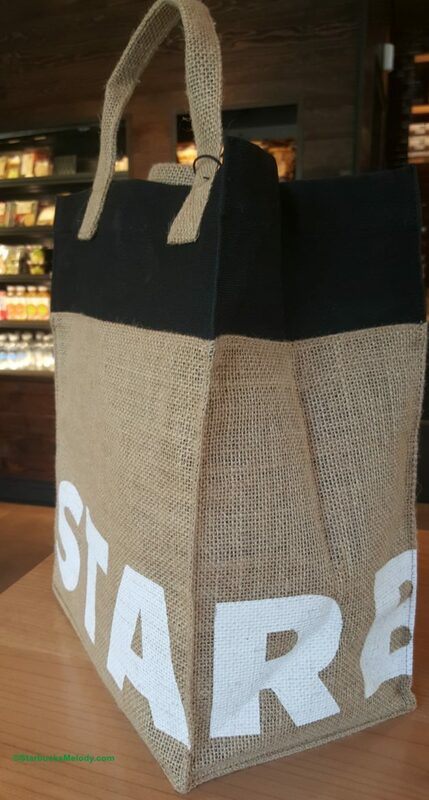 Be on the look out of a collection of delicious snacks and a great burlap Starbucks sack at your local store! Beginning on July 7th, there will be 3,400 Starbucks locations across the country selling this curated collection of artesian snacks. Some will surprise you! It’s possible you’ve never heard of some these treats and snacks before. 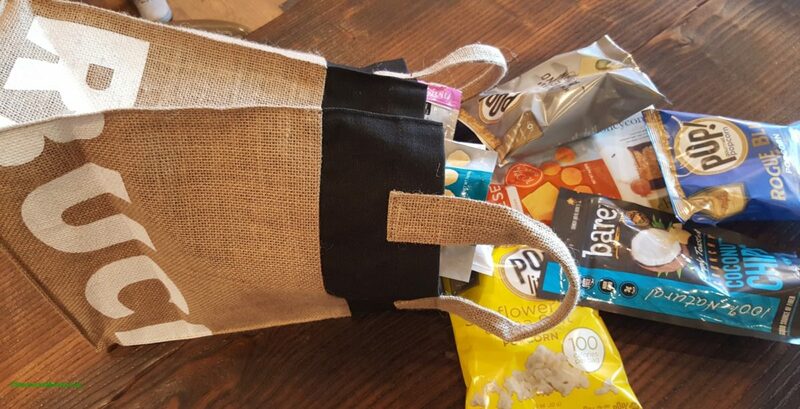 If you’re wondering how the 3,400 stores got picked, the stores that will carry the snacks have customers who are more likely to buy these kind of grab-n-go type items. These are limited summer items only. The Pop! 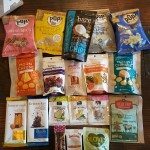 brand popcorn won’t be replacing the existing popcorn in the stores. 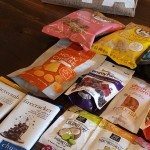 I had the chance to meet up with Erin S. inside the Starbucks headquarters who helped select the snacks and treats. She said they used 13 different suppliers, some of whom are smaller companies. The “Moon Cheese” is a smaller Ferndale, Washington business. The Cheddar Moon Cheese was incredible. It’s like extremely fancy Cheetos. I strongly suggest you try this! Another one of my favorite things was the Field Trip beef jerky. It tastes amazing. I’ve long been a fan of Pop! brand gourmet popcorn, especially the Almond Roca flavor Pop! popcorn, which is included among the snacks you’ll find. 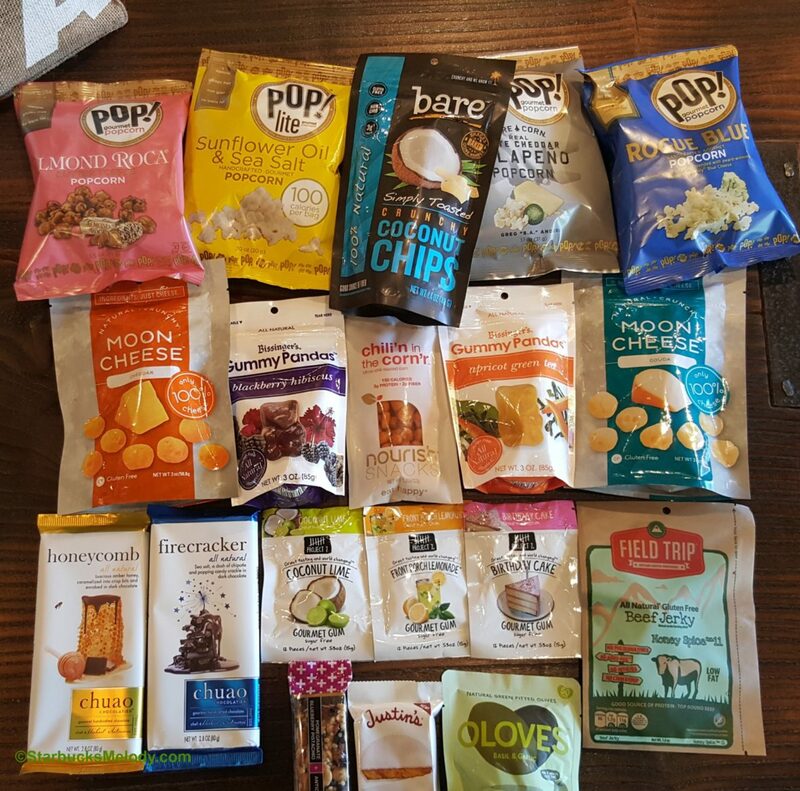 Some of the snacks, as I mentioned (like the Pop! popcorn) I was already familiar with or had heard of. Before my meeting with Erin to discuss snacks, I’d never heard of Project7 gum. It looks like they’re a tiny San Clemente, California business. I asked Erin what her favorite snacks are. She said it was pretty hard to pick, but she really likes the Nourish Chili’n in the Corn’r Citrus-chili roasted corn. 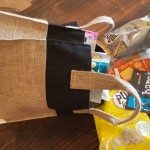 The burlap sack, like the snacks, will only be at the specially-selected 3,400 stores, and the cute burlap sack will retail at $14.95. The Chilin’ the Corn citrus-roasted corn retails for $2.45. The bare Coconut Chips will retail for $2.65. The Pop! gourmet Sea Salt pop corn will retail for $1.55. Look for the gums to be around $1.65. Chuao honeycomb chocolate retails for $5.95. That’s a sampling of the snacks, just to give you an idea of the price ranges for these delicious snacks. All this snack discussion makes me wish I were going on a summer road trip and stocking up on snacks! I don’t have the list of all 3,400 Starbucks stores with the snacks, but I can mention a few stores where you’ll find them: Alki Beach Starbuck sin Seattle, the Phinney Ridge Starbucks in Seattle, the Fremont Starbucks in Seattle, the Lodge Starbucks in Bellevue, Washington, PCH & Crown Valley Parkway in Dana Point, California, as well as the Campus & California Starbucks in Irvine, California. For the aspiring coffee masters reading this, I think that some of these snacks would make for great pairing options. I bet the Moon Cheese would pair beautifully with Sumatra. I have to say, I loved grazing on snacks as I wrote this. Thank you to the Starbucks partners at the headquarters who invited me in for a sneak snackin’ preview. I have to tell you that even though I received a complimentary burlap sack filled with snacks, it didn’t affect my review or article. 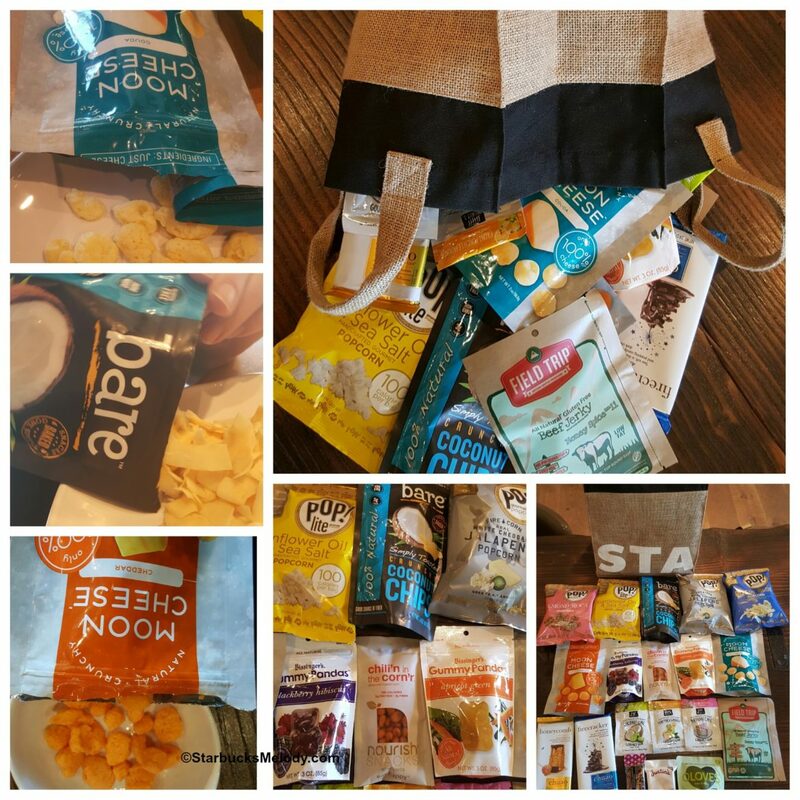 Have you tried these snacks before? I bet the burlap sack will sell out quickly! It’s $15 for the bag alone or for the bag-filled-with-snacks? Wish they’d list which locations have… I’d rather not waste time driving around town. Dave, the bag is sold separately. What city are you in? I’ll try to get a few more locations, from the Starbucks partners whom I worked with on this article. I read this article with great interest, Melody… and with a growling tummy. I am always a fan of good snacks. 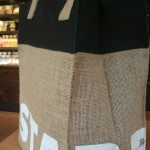 Now I’m just wondering how I could get my hands on that adorable burlap bag with a few goodies inside? Are these available in Canada? Thanks! These look delicious. I read your post and a post from the Starbucks account and the pictures are driving me crazy! I need to find out if any stores in Texas have this stuff!!! It’s always nice to see new products in the stores, but large companies like Starbucks often hold a large advantage over new and smaller companies looking to gain exposure. In the long run, Starbucks tends to prefer in-house brands over external brands. But they cannot develop and test all of their new packaged products in-house. While it is great exposure to get your product placed into Starbucks, if it does well, there’s a good likelihood that Starbucks will develop their own branded version of your product. Look no further than Kind bars and Starbucks’ previous popcorn vendor. Additionally, the expense and challenge of producing to Starbucks’ scale often puts a tremendous burden on these small companies and while they plan for their expenses to be offset by long-term relationships with Starbucks, the opposite tends to be the case as Starbucks ultimately drops their product line but they’re still stuck with the cost and exposure of scaling up to support Starbucks. The bottom line is Starbucks isn’t in the business of promoting someone else’s brand. You will be pushed to develop private label products under a Starbucks brand, or pushed to be acquired. Store #13726 @ Beltline/635 in Irving, TX has it. I like the Firecracker chocolate! Bordentown, NJ has the display. So many delicious snacks. I like the olives best so far! Nourish Snacks website has a downloadable pdf file that lists all the stores their snacks are available, they are part of the snack stand so that should show all the stores where the new snacks are. Thanks @Michelle!! I will definitely be stopping by to pick up some treats!!! All the stores in my area in Virginia have these snack items! I hope they continue this and offer other small businesses for future promotional seasons! @BK – Yes, you can use your Lucky Dozen rewards on these snacks! I’ve done that already! Enjoy! Anyone know where in brooklyn ny they are carrying these new snacks? I found the Moon Cheese at both Starbucks inside Union Station in Washington, DC. The Toffee flavored Popcorn with Almond Roca is #AMAZING!! I’ve only seen it in 1 Starbucks….how can I find out if they have them at other locations. I’d actually like to order several….How can I order this in bulk???? Thanks! !